Since President Donald Trump threatened the North with “fire and fury” in August, Pyongyang has conducted its most powerful nuclear test, threatened to send missiles into the waters around Guam and launched two missiles of increasing range over U.S. ally Japan. It tested its first-ever intercontinental ballistic missiles in July. South Korea’s Joint Chiefs of Staff said the missile traveled about 3,700 kilometers (2,300 miles) and reached a maximum height of 770 kilometers (478 miles). North Korea has repeatedly vowed to continue these tests amid what it calls U.S. hostility — by which it means the presence of tens of thousands of U.S. troops in Japan and South Korea. Robust diplomacy on the issue has been stalled for years, and there’s little sign that senior officials from Pyongyang and Washington might sit down to discuss ways to slow the North’s determined march toward inclusion among the world’s nuclear weapons powers. Friday’s missile, which Seoul said was the 19th ballistic missile launched by North Korea this year, triggered sirens and warning messages in northern Japan but caused no apparent damage to aircraft or ships. 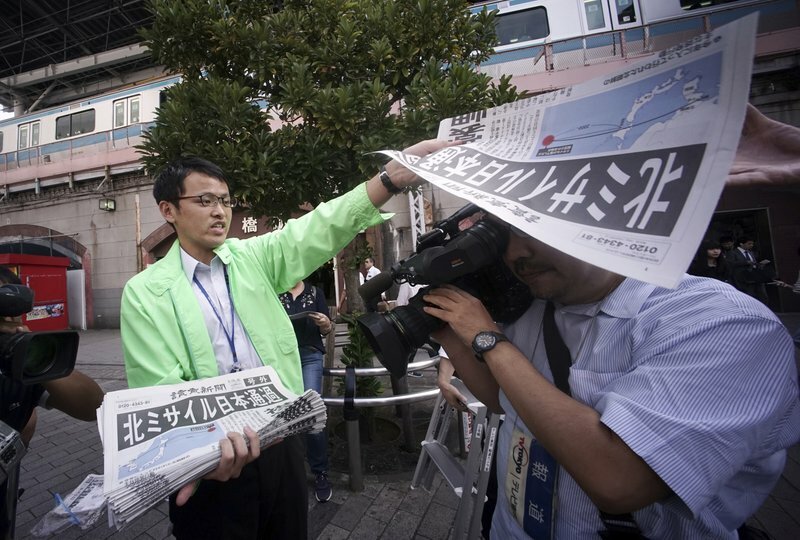 It was the second missile fired over Japan in less than a month. North Korea conducted its sixth and most powerful nuclear test on Sept. 3. The missile was launched from Sunan, the location of Pyongyang’s international airport and the origin of the earlier missile that flew over Japan. Analysts have speculated the new test was of the same intermediate-range missile launched in that earlier flight, the Hwasong-12. That missile is linked to North Korea’s declaration that it means to contain the U.S. Pacific island territory of Guam, which is the home of important U.S. military assets and appears well within the Hwasong-12′s range. Friday’s missile test was met with the usual outrage. South Korean President Moon Jae-in ordered his military to conduct a live-fire ballistic missile drill in response to the North Korean launch and instructed government officials to pursue “stern” measures to discourage Pyongyang from further provocations. 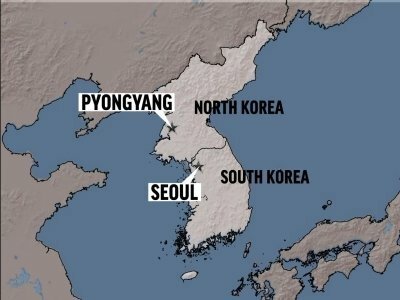 South Korea’s Joint Chiefs of Staff said one of the two missiles fired in the drill hit a sea target about 250 kilometers (155 miles) away, which was approximately the distance to Pyongyang’s Sunan, but the other failed in flight shortly after launch. Japanese Prime Minister Shinzo Abe and U.S. Defense Secretary Jim Mattis both called the North Korean launch a reckless act. The U.N. Security Council scheduled an emergency closed-door meeting to be held Friday afternoon in New York. Trump has not commented. The North American Aerospace Defense Command and the U.S. Pacific Command said the missile posed no threat to North America or to Guam. South Korean experts have said North Korea wants to make missiles flying over Japan an accepted norm as it seeks to win more military space in a region dominated by its enemies. North Korea’s August launch over Japan came weeks after it threatened to fire a salvo of Hwasong-12s toward Guam and bracket the island with “enveloping” missile fire. The North’s latest launch might be an attempt to demonstrate its ability to fire a missile close to Guam, which is 3,400 kilometers (2,112 miles) away from North Korea, said Kim Dong-yub, a former South Korean military official who is now an analyst at Seoul’s Institute for Far Eastern Studies.